This group will be focused on the development of the Space CompactPCI Serial standard, ensuring support of additional serial interfaces, such as SpaceWire, TT-Ethernet and Rapid I/O for air-to-air communications. Issues related to the provision of high reliability, detection of faults and environmental safety is also included in the list of priority tasks. One of the group’s main purposes is to maintain the standard and simple principle of system building and guarantee its maximum compatibility between backplane and the boards. According to Joe Pavlat, President and Chairman of the PICMG, expansion of the CompactPCI Serial for application in space technologies is another step in the development of standards of this time-proven family. Basic CompactPCI Serial specification already has the mechanical performance and conduction heat-removal availability, which are vital for space applications. The both Eurocard formats (3U and 6U) are supported. The Space CompactPCI Serial enables developers to use advanced engineering solutions for high-tech space industry, in this case enjoying the opportunity of the repeated use of tried technologies, which in the end sufficiently decreases development expenses. Superior resistance to harsh environments. The primary use of the new Space CompactPCI Serial standard is the development of computers and controllers, placed onboard of satellites and other space crafts. The basic CompactPCI standard has a long story of application in space technologies: starting from control systems for Mars rovers and satellites to performing various tasks aboard the International Space Station (ISS). A good example is a control system implementation in “Opportunity” Mars exploration rover. The rover is controlled by two computers based on the CompactPCI® standard, which were developed and built by BAE Systems engineers. This year the Opportunity rover celebrates its 12th anniversary of operation on the Red Planet. The rover was landed on Mars January 24, 2004 and remains active up to this time. Transfer of data and receipt of commands from the control center. RAD6000 CPU (25 Dhrystone, 21 MIPS @ 25 MHz). Control chip with possibility of error correction for SRAM, 4 MB of local EEPROM and 512 KB of bootable memory. Support of multiplex channel of inter-module data exchange over MIL-STD-1553B (GOST 26765.52-87). Equipped with a configurable FPGA module for adjustable user interfaces. The onboard computers maintain operability in the temperature range from -40°C to +40 °C. During the Martian solar day (often called a Sol) a maximum registered temperature was 22 °C and there were no problems in terms of maintaining temperature conditions. Martian surface temperature at the winter polar caps can get down to -153 °C, therefore maintaining temperature conditions is a vital issue here. In order to provide a comfortable temperature mode, the onboard computer was placed in a weather-proof enclosure, which is warmed by way of electric heaters, eight radioisotope sources and a self-generated heat. When Opportunity was landed, NASA team members were expected it would fail to function within the first several months due to Mars harsh environment conditions. The scheduled time of the exploration rover operation was set to about 90 days. However, the rover is powered only by solar batteries and is still gathering data. The “Opportunity” rover landed inside Eagle crater, located on the Meridiani Planum extraterrestrial plain. This time the robot is in the area of Endeavor crater, it means that the rover has travelled more than 40 km from its initial landing site. CompactPCI Serial is a viable and important technology for a wide range of applications. 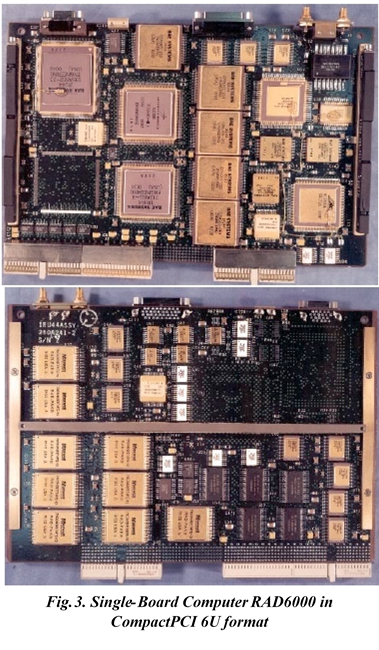 Computer modules implemented in accordance with the CompactPCI standard, have proved their operability in many industrial applications, including robotics, onboard systems, industrial automation, scientific research, IP telephony and communications in surface transport and shipbuilding. Eurocard design and conduction heat-removal availability make the CompactPCI Serial standard a perfect choice for manufacturing special purpose equipment, building satellites and space applications.